Riots and sexual subcultures in Voices From The Old Bailey, Maître lawyer falling in love with his client in The Other Simenon, and who would want to be a doctor dealing with the ethics of under-age teenagers getting pregnant and being tested positive for HIV and that’s not all Tina Pepler managed to electrify into an Afternoon Play. 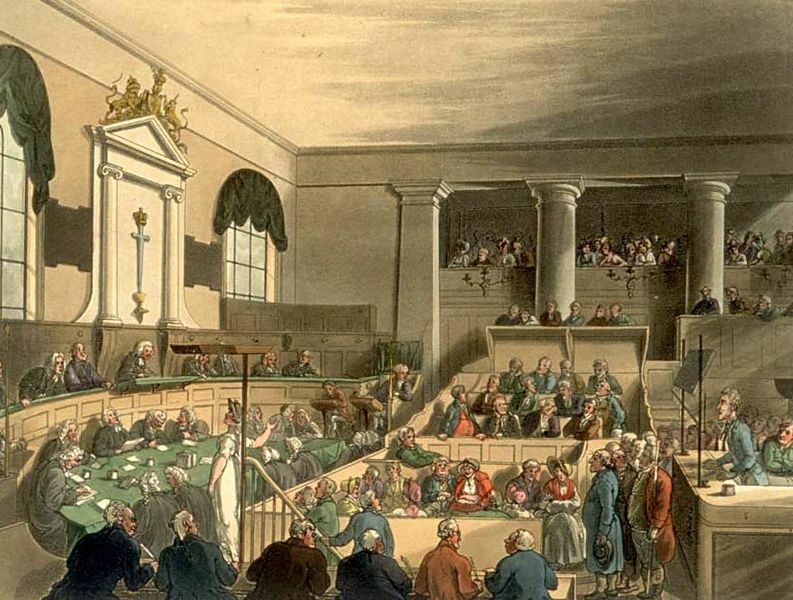 BBC Radio Four has begun a second series of documentaries and historical discussions of the online archive of transcripts of crimes and trials taking place in Britain at the Old Bailey during the 18th century. They are presented by the charismatic Amanda Vickery, who is Professor of Early Modern History at Queen Mary, University of London. An accompanying publicity image on the BBC web-site shows her wearing a leather style jacket. She is a counter-stereotype of academia. Cool, interesting, and with a great sense of humour. When she talks, her democratic and engaging voice tells a story without any hint of lecture. She reminds me of another legendary BBC professor of sociological matters, Laurie Taylor, and I’m pretty sure I recall him wearing a similar jacket in a BBC photo sometime in the past. Perhaps it’s obligatory for social historians. I only mention the jacket because I want one too! This second series is produced brilliantly by Elizabeth Burke of Loftus Productions. The programmes sound like Elizabeth and Amanda have been having a lot of fun cavorting intellectually around hidden and forgotten sites that symbolise London’s dark, seedy and violent past. There are pubs to visit and the occasional chapel and church or two. Along with an accompanying witty and informative band of other academics, the microphone and voices conjure life in male and female brothels, and we really do feel like we are taking part in a riot or two. 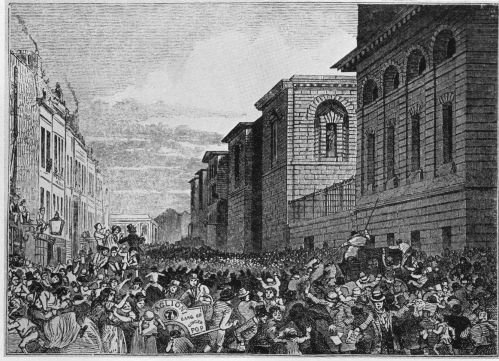 The first programme investigated rioting sailors who roughed up bordellos after losing their watches when forgetting to make their excuses and leaving. If my father had ever been a sailor I am sure he would have advised me never to take my watch or boots off particularly when frequenting West End brothels in 18th century London. Amanda struck up the wonderful mental image of the women of the Strand being turned naked out of their brothels by the outraged matelots in clouds of duck and goose feathers unleashed in their gutting and ripping of all interior furnishings. This is the opening sequence of some wonderful film that has to be made of the events discussed and eventually leading to trials and execution for felony at the Old Bailey Sessions House. It seems you had an hour to leave the scene of a riot that could only be declared by a magistrate before your misdemeanour became a felony. It was the difference between a sojourn in the dungeons of Newgate, transportation to Botany Bay or capital punishment and dangling from the Triple Tree. This is something I knew as I was trained in law by the great nephew of the Prime Minister Stanley Baldwin. He was also called Stanley Baldwin, a night editor of the Times and a barrister. He believed that it was essential to understand the law pertaining to brothels and riots. 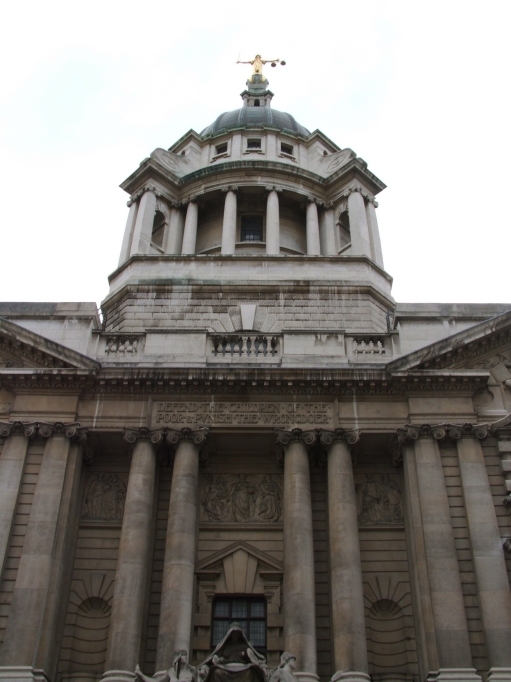 And his inspirational introduction to the delights of court reporting meant that I spent 16 years of my working life as a journalist at the Old Bailey between 1981 and 1997. 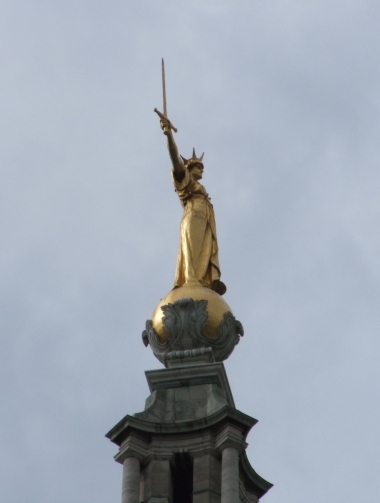 Punish the wrongdoer and defend the children of the poor? So you might think that Amanda and her merry band of academics, Professor Peter King, Dr Katrina Navickas and Professor Tim Hitchcock, co-founder of the online archive, Old Bailey Online, have little to tell me that I don’ t know already. I can assure you that I could never be so arrogant. These programmes are enlightening and beautifully crafted with dramatised extracts, folk songs and ballads of the past and intelligent analysis and contextualisation of the most compelling social history. There was a little mischief and naughtiness in the way they discussed the carnivalesque and ritual of violent civil protest. The ironic displays of gibbets complete with hanging petticoats, the men dressing as women, and the performance of protest were equated with the recent present day occupation of Fortnum and Masons, somewhat cryptic references to how powerless we are to protest against Tescos, and the most delightful evaluation of the libertine and pornographer John Wilkes. Yes, he who founded the English freedom of the press and who has pigeons plopping on his bilious statue in New Fetter Lane. 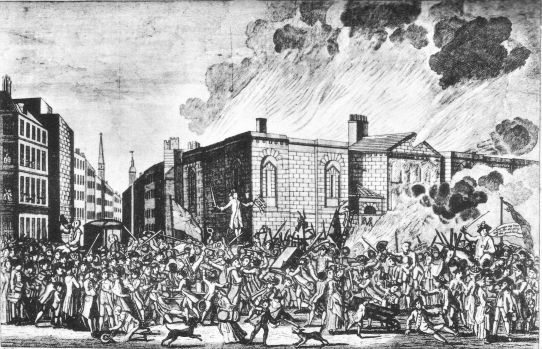 the anti-Catholic Gordon riots, the worst episode of civil unrest in British history. The whole of central London was garrisoned with mounted troops, who shot to kill. Professor Vickery reveals that left-wing historians of the 70s and 80s ignored the Gordon Riots because they didn’t fit their ideological model of the noble rioter. uses court cases to explore the lives of gay men and cross-dressers in the 18th century. Lesbians did not appear in court as lesbianism was not against the law – but we find and record an 18th century lesbian love song, as well as the hilarious ‘Bumography’. this was one of the naughtiest places in London – a notorious gay cruising ground, and site of the ‘bog-house’, the public toilets which were a place of assignation. The accompanying websites for each programme have excellent links to the trial transcripts and other historical resources. This is truly marvellous documentary programming, and it has me looking forward to Wednesdays. 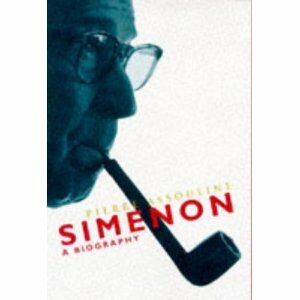 Another excellent reason for listening to BBC Radio 4 on Wednesdays is a three part run of The Other Simenon in the Afternoon Play strand. The dramatisations are by Ronald Frame and the direction in Scotland by Bruce Young. The writing, direction and performances in these productions has been quite outstanding. They capture so evocatively the culture of Paris and northern France and dramatically we are able to sympathise so fully with the emotional angst of Sartrean existential realities about human relationships and deep emotional dilemmas. In Case of Emergency- cover of rare copy. There is a surprising and refreshing social dignity in the tolerances and respectabilities of the social milieu depicted in Simenon’s exploration of the twilight zone of bourgeoisie and underworld. the obsessive affair between a lawyer and a jewel thief. When her plan to rob a jeweller’s shop goes wrong, Yvette – young, beautiful and dangerously impulsive – asks middle-aged lawyer, Lucien, to defend her in court. When he wins the case they begin an affair but he discovers that Yvette has a boyfriend who has no intention of giving her up. Jimmy Chisholm as Lucien, Lisa Gardner as Yvette and Sarah Collier as Viviane plumb the very depths of the souls of their characters in terrific performances. Laura Smales and Kenny Blyth add to a magnificent ensemble cast. When Gina fails to come home one night, Jonas Milk tells his inquisitive neighbours that she’s visiting a friend. But the gossips in this small country town know Gina has been having flagrant affairs and when it becomes clear that she’s disappeared, the bookseller is drawn into a nightmare of police enquiries and painful discoveries. If BBC Radio Four wants to attract young audiences to audio drama, then they can do no wrong by commissioning more plays from the distinguished and award-winning playwright Tina Pepler. In Positive (Thu 21 Jul 2011 14:15) there was carefully researched writing on medical ethics and human relationships that packed so much dramatic intensity in about 43 minutes that I had to catch my breath. Plot twists and internal and external crises of characterisation kept you guessing. The drama was linked to and commissioned to accompany the BBC Radio Four’s stimulating Inside the Ethics Committee, presented by Joan Bakewell. a pregnant teenager and her angry mother present the ante-natal team with a series of increasingly difficult decisions. When Rosie is admitted to A&E with stomach pains, she’s shocked to find out that she’s pregnant. Her mother is even more horrified, and the ante-natal team must decide if Rosie is capable of making her own decisions without her mother’s consent. The situation is further complicated when Rosie wants to keep an even more shocking piece of news from her mother. Whilst I never had the talent or ability to be a medical doctor, listening to plays like this made me realise that I am not sure I would have been able to cope. The realism of the script, direction by Sara Davies, and performances of Nicola Miles-Wildin as Rosie and the rest of the excellent cast reminded me of Channel 4’s current documentary series 24 hours in A & E.
Libertarian Spirit is taking a sabbatical until early November as Tim Crook has a complicated project at Goldsmiths to deal with until then. I found your blog having heard a few of the plays of the week on the podcast and then attempting to find out more information about them. As I live in Mexico it’s almost impossible to listen to anything live due to the time differences but discovering the potw podcasts has reminded me of how exhilarating radio drama can be – I was especially enthralled by Crimes of Mancunia and the Day We Caught the Train so it was excellent to read my feelings being expressed in a way here that is much more erudite than I could ever manage.